Both of my parents are from the lovely island of Barbados. Growing up they would send my siblings and I to the country to stay with our paternal grandmother for the summer. One of my fondest memories is of watching the Kadooment celebration that signifies the end of Crop Over. Seeing the men and women dressed up in extravagant costumes was such a beautiful sight. Last year I decided that I would take part in Crop Over in 2017. The experience was one I will never forget. Perhaps you’ve seen the recent pictures of Rihanna’s Crop Over costume or saw pics of some of your friends taking part on social media. Regardless of what has piqued you’re interest I’m breaking down how you can take part in this beautiful cultural celebration. 1. Follow the bands with costumes you like. This year 13 bands took part in Kadooment Day. My top 5 picks are below. 2. Budget $500-1,000 for your costume. The cost of your costume varies by the band and your position (front line, mid line, back line). The average costume price that I saw was around $500, however I recommend budgeting $500-$1,000 to be safe. Be aware that this price includes your costume, accessories, meals, and drinks on Kadooment Day. 3. Look out for costumes being released around the second week in May. Hopefully you’re reading this post close to the time it was published. If that’s the case you’ll have 9 months to save up for your costume, flight, accommodations, and fetes. Find a costume you like once they’re released and follow the band’s instructions for payment. Several companies allow you to pay a deposit to reserve your costume and pay the remaining balance at a later date. 4. Start tracking flight prices (expect higher than normal fare). The airport code for Barbados is BGI. Plan to arrive 2-3 days before Kadooment to collect your costume in advance. Because Crop Over is a popular time to visit the island expect to pay higher fares than normal. I’ve flown to Barbados frequently and have never paid more than $500RT for a plane ticket, until attending Crop Over this year. I suggest hoarding mileage points or airline credits for this trip, as airfare will likely be the most expensive portion of this trip. After locking in your flights book the place where you’ll be staying. If you will be travelling with a large group you’d be best suited renting a home on Airbnb or Home Away. If you’re looking to stay in a central area I recommend St. James parish. If you want to be walking distance to nightlife, restaurants, and shopping look into the St. Lawrence Gap area. However, do not despair if you can’t find accommodations in either area. The island is only 166 sq. miles so travel from one tip to the other does not take long. 6. Book your makeup artist and figure out your hairstyle. Hairstyle and makeup can make or break a costume. I recommend opting for an up-do or braids, as the route is long and hot. You’ll be much more comfortable with your hair up and off of your face. The makeup artist I used this year (Instagram below) did a phenomenal job and I plan to use her again in the future. I was referred to her by my cousin, however you can search hashtags on social media for other makeup artists (try #CropOverMakeup #BarbadosMakeupArtist #BarbadosMUA #BarbadosBaseMakeupArtist). 7. Buy tickets to parties(fetes). Fetes are a large part of the Crop Over experience. Follow the Instagram page below to get info on all the parties occurring on the island. Two popular ones are Limerz Cruise and Caesar’s Army. Visit Bridgetown Market. Bridgetown Market is a street fair that only occurs during Crop Over. Various vendors, selling food, clothing, and souvenirs, line up down the highway in Bridgetown, next to Brandon’s Beach. Admission is free. This is a great place to try local cuisine and pick up some gifts for loved ones. My favorite stall for fresh fish cakes and an ice cold Banks beer was Sandy’s Grill and Chill. Stay hydrated on the road. 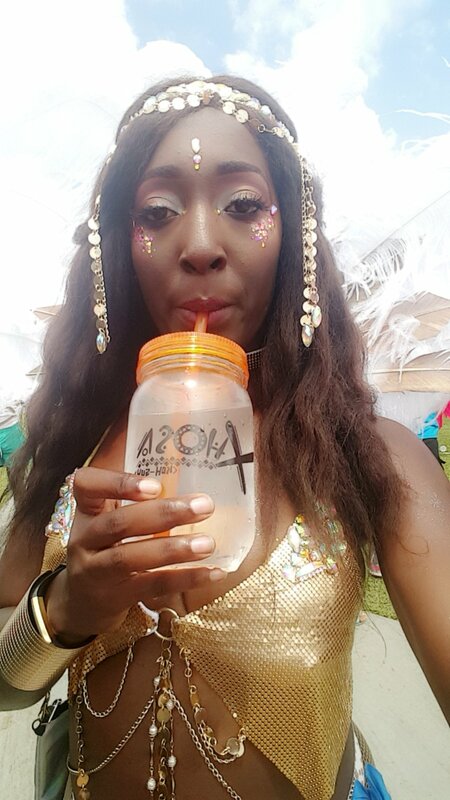 Be sure to bring the water bottle provided by your band with you on Kadooment Day. There’s water stations around the stadium where the route starts and on the band trucks. Temperatures easily hit 80º and above. Combine the heat with the distance walked and feathers on your costume and you can imagine how hot you can get. Be sure to drink plenty of water along the way. Be prepared to walk 6+ miles. I was not mentally prepared for the length of the Kadooment Day route. You have the option of not completing the entire route, however, if you intend to, be ready to walk over 6 miles in the sun and possibly rain. Learn how to wuk up and lookout for Private Ryan’s Crop Over mix. This is arguably the most important tip to know. Bajans don’t whine, we wuk up, and we do so quite well. Be sure to practice before Kadooment Day so you don’t make a fool of yourself on the road. If you’d like to familiarize yourself with local music look out for Private Ryan’s Crop Over Mix. He creates a new playlist every year with the hottest songs that you’ll be sure to hear at Crop Over. The 2017 mix is available here. As always, if you have any questions, concerns, or tips of your own be sure to leave them in the comments below. I hope to see you all at Crop Over next year!